Most psychologists consider cultural differences to be largely learned. However, because of genes and evolution, some cultural characteristics might be inherited biologically. If there is a gene for a certain predisposition, like aggression or art, and your parents and grandparents have it, then there's a good chance you will have it too. This explains why some cultures might be more aggressive or artistic than others. If a cultural behaviour gives an evolutionary advantage, then it might be passed on as a survival trait. This explains why some cultures might encourage more than one wife or not eat certain foods - in the region where that culture developed, these behaviours had fitness. Biological explanations of culture are controversial. This is because they give support to stereotypes and racism. 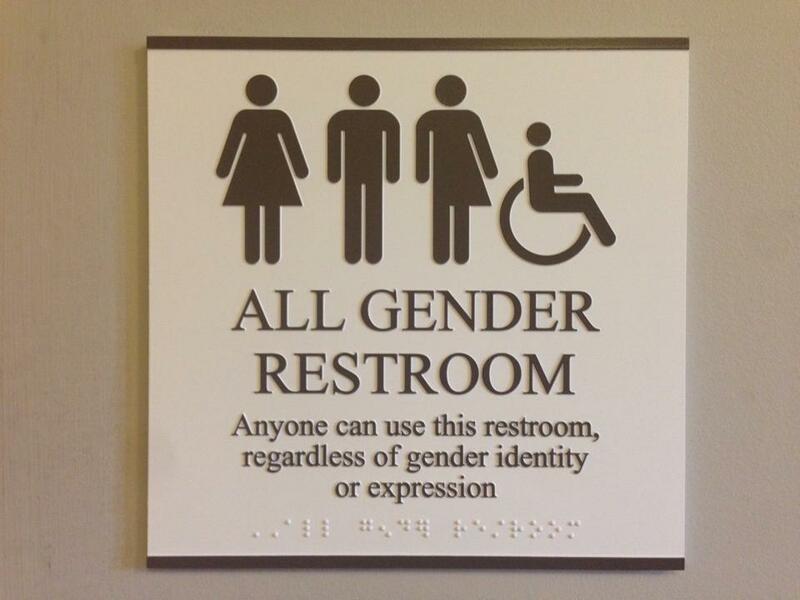 Whether gender is biological or not is a very controversial topic. It's been controversial in Psychology for decades but that controversy is now all over the Internet too. 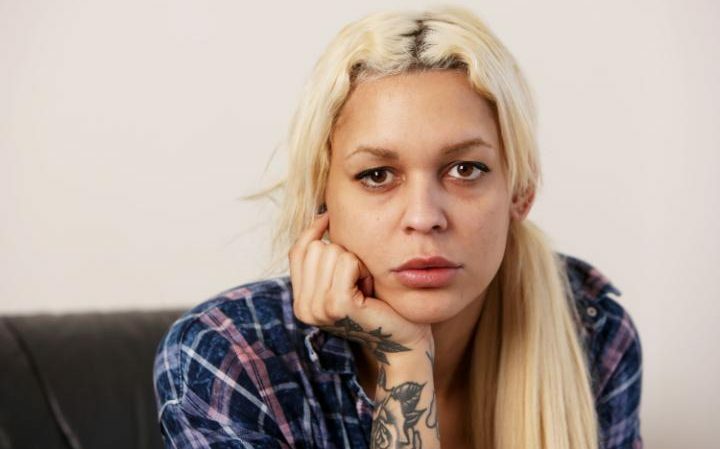 Tara Hudson is a transgender woman in Britain who was convicted of assault and sentenced to a male prison. In 2015, two transgender women died in custody in the UK. Psychologywizard is staying out of this debate. It's only an A-Level. I'm tempted to say, pick an easier biological difference to write about. Hormones: men's brains are shaped in the womb by the male growth hormone testosterone and testosterone is much higher in men than women; it is linked to aggression. The female growth hormone is oestrogen. However, women's body's also produce testosterone, but usually in smaller amounts than men. Brain lateralisation: Male brains are more lateralised than female brains. This means that male brains have functions located in one hemisphere or the other but female brains are more likely to carry out these functions with both hemispheres. Neurotransmitters: There is evidence (Jovanovic, 2008) that women's brains have more serotonin receptors than male brains. These differences might explain gender differences. For example, men are more likely to be involved with aggression and violence (linked to testosterone) and women to suffer depression (linked to serotonin). Male superiority in mathematics has been linked to brain lateralisation - and so has the increased likelihood of autism in males. 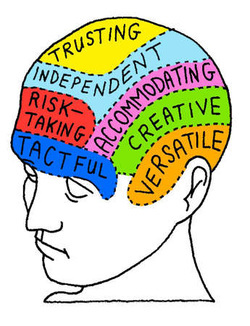 Personality traits like Extroversion and Neuroticism have been linked to brain structures by Hans Eysenck. Extroversion is caused by a brain process known as the Ascending Reticular Activating System (ARAS). The job of the ARAS is to maintain an ideal level of alertness. If the ARAS is under-active, a person does not receive enough stimulation and needs to go looking for it in the environment. These people are extroverts: outgoing and easily bored. At the other end of the scale are the introverts, whose brains receive too much stimulation; they stay away from crowds and excitement and prefer calm and quiet. Neuroticism is based on the Autonomic Nervous System (ANS), which enables us to respond to stress. If the ANS does its job effectively, a person will be stable, with a consistent mood and an ability to learn easily. If the ANS is inefficient, the person will be neurotic, with changeable moods and difficulty learning from experience. Eysenck (1975) later proposed a third dimension called psychotic (P) which is a trait to do with compassion and morality. High P scores show antisocial traits like selfishness, hostility and impulsivity. P is linked to hormone activity - especially testosterone. Eysenck created a questionnaire called the Eysenck Personality Questionnaire (EPQ) to measure P, E and N scores. A famous example of the importance of the brain for shaping personality is Phineas Gage, an American railway worker who suffered a terrible accident in 1848. The railway workers used dynamite to make the ground flat for laying the rail tracks, but an unexpected explosion nearly killed Gage. It blasted a "tamping iron" (a metre-long iron nail) through Gage's skull; the iron entered through Gage's cheek, passed through his brain and shot out of the top of his head. fitful, irreverent, indulging at times in the grossest profanity (which was not previously his custom), manifesting but little deference for his fellows, impatient of restraint or advice when it conflicts with his desires... In this regard his mind was radically changed, so decidedly that his friends and acquaintances said he was "no longer Gage". Recreation of the injury, Gage's preserved skull and a photograph of Gage with the tamping iron, which he kept as a souvenir and called his "life-long companion"
The Gage study is often taken to show that damage to the frontal lobe changes personality. This links with the classic biological study by Raine et al. which shows that the frontal lobe was under-active in brain scans of murderers. We know that the frontal lobe (in particular, the prefrontal cortex) handles self-control and rational behaviour. However, it's not as clear-cut as that. Harlow's much-quoted description of Gage was not published until after Gage's death and Harlow didn't stay in touch with Gage for the 12 years after the accident, when Gage worked for a stagecoach company. There's no evidence from Gage's lifetime that his personality transformed. The photograph of Gage with his tamping iron doesn't look like a man who has lost the ability to behave rationally. As part of the Biological Approach, you study the effects of drugs on the brain. Personality theory explains some of the features of addiction. 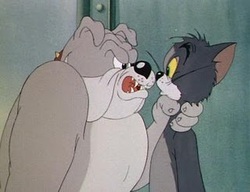 Remember there are non-biological explanations of aggression, such as Social explanations in terms of obedience to authority or discrimination against out-groups or Learning explanations in terms of role models. There is also the Freudian explanation you must consider. This is where individual differences and personality theory comes in. Experimenting with drugs is clearly linked to having a psychotic (high-P) personality, since drug-taking is risky, antisocial and unrestrained and these characteristics all link to P. Some creative types also believe (rightly or wrongly) that drug-taking unlocks their imagination and, according to Eysenck, creativity is linked to high P-scores too. ​Drugs are also stimulating and people with strongly extrovert (high-E) personalities crave stimulation. However, most extroverts get the stimulation they need from sport, socialising, etc. The other function of drugs is to regulate mood and this is something strongly neurotic (high-N) personalities find difficult. The combination of high-E and high-N along with high-P might be a "perfect storm" for drug-taking and this ties in with Eysenck's idea that criminals are neurotic extroverts with psychotic tendencies. ​Quitting drugs is much easier for introverts (low-E) who don't require as much stimulation anyway. It would also be easier for stable personalities (low-N) who can regulate their mood better and don't experience the same "lows" from withdrawal. Empathic people (low-P) are much more likely to be influenced by friends and loved ones who are hurt by their drug habit and put pressure on them to quit. People often say they have an "addictive personality" but that's usually just an excuse for them to do what they want to do while making out it's beyond their control. There's not much evidence for "addictive personalities" but some people may find it harder than others to resist temptation. Eysenck's ideas have stood the test of time and are still being researched. 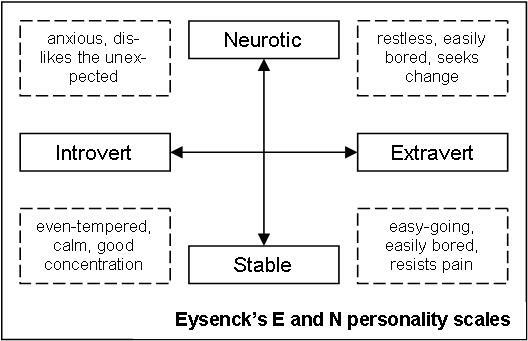 The "Big Five" have replaced Eysenck's simple PEN Model, but Extroversion (E) and Neuroticism (N) are backed up by studies of brain functioning and strongly predict people's behaviour in different situations. For example, Colin DeYoung (2010) used MRI scans on 116 men and women who had completed personality tests to measure the Big Five traits; there was a significant correlation between activity in certain parts of the brain and high or low scores on certain traits. Even if there are clear biological differences between (say) men and women or people from different cultures, it isn't clear how significant they are. For one thing, human brains are all far more alike than they are different: the similarities are huge and the differences are tiny. Furthermore, we can't be sure whether brain differences are innate or not. We know that levels of hormones and neurotransmitters change as a result of life experiences and brain structures shrink or grow based on how we use them (this is called brain plasticity). Even if boys who are good at maths have more lateralised brains than girls, it doesn't mean they were born that way: they could have developed lateralised brains because they spent so much time doing maths! A deeper criticism of personality theory is that there are in fact no consistent traits that define us. Walter Mischel (1968) argues that the apparent consistency in people’s behaviour is an illusion caused by the fact that we usually observe people in similar situations. This is a situationalist view - that situations (environments) produce out behaviour, not personality traits. The Exam Board expects you to compare the biological explanation of personality with the Freudian explanation of personality. Freud's ideas are explained on another page. For now, I'll compare and contrast the biological explanation with the situationalist explanation that "personality" is learned. The biological explanation of personality supports the nativist (nature) view of human behaviour, but the Learning Approach takes the situationalist (nurture) view that all our behaviour comes from our environment. Strict Behaviourists like B.F. Skinner would argue that ALL behaviour is learned and that human beings are born as tabula rasa (a bank slate), with individual differences like personality being added later. Most psychologists take a middle way between these extremes. Genetics gives us predispositions to behave a certain way, but we can resist these impulses if we try. This seems to be Eysenck's position, but he thinks biology is more influential than learning (75% as opposed to 25%). If the nativist viewpoint is correct, then personality is innate and difficult to change. This is way the idea of biological differences is unpopular with many psychologists. For example, if boys are biologically superior at maths because of brain lateralisation, it follows that there's not much point in investing time and money in girls' education to improve their mathematics. It might lead to a complacent "boys will be boys" attitude to male aggression, rather than trying to stop it. It might also lead to any distressed women being lazily diagnosed as clinically depressed. But of course, some brain differences do exist and might help us better understand depression and aggression or conditions like autism. An 8-mark “evaluate” question awards 4 marks for describing individual differences from the biological perspective (AO1) and 4 marks for evaluation (AO2). You need a conclusion to get a mark in the top band (7-8 marks). ​Note: the question doesn't ask about "personality" because the Specification only states "individual differences". It's up to YOU to remember that this means personality. One example of individual differences is personality which is explained by Eysenck's PEN Model. ​Extroversion is a trait that measures how much stimulation your brain needs. Extrovert people need stimulation but introverts are easily over-stimulated and prefer quiet. ​Neuroticism measures how emotionally unstable you are. Neurotic people have mood swings and don't learn easily but stable personalities have more self-control. ​Psychoticism was the last trait Eysenck added in 1975. 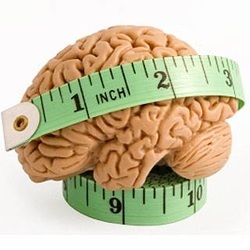 It measures impulsivity and aggression but also creativeness. People low in psychoticism may be empathic and inclined to follow rules. Eysenck found a link between high N-scores and battle-fatigued soldiers and high P-scores and prisoners. ​DeYoung has found links between E and dopamine, N and serotonin and P and the MAO enzyme. There's also a link between N and the right hemisphere. ​However, these scores depend on questionnaires which may be unreliable. This is because respondents may suffer from demand characteristics and give the answers they think the researchers are looking for. P has been criticised by Amabile for being too vague. Most psychologists think artistic creativity is different from psychoticism. An interactionist approach includes both cognitions and biology. This is why the PEN Model is a bit out of date and the "Big Five" are preferred instead, taking out P and adding Agreeableness, Conscientiousness and Openness. Notice that for a 8-mark answer you don’t have to include everything about personality and the brain. 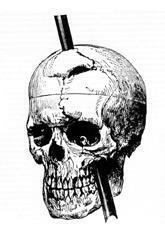 I haven’t mentioned the other parts of the limbic system, testosterone or the case study of Phineas Gage. But it is a balanced answer - one third description, one third application and one third evaluation.